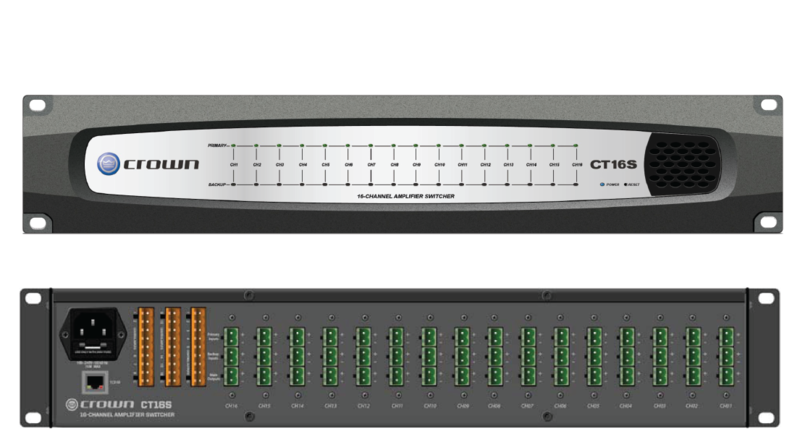 The CT16S amplifier switcher gives users of public address systems confidence that their system is operational. Each amplifier switcher has 16 primary amplifier inputs (which connect to the amplifier outputs), 16 backup amplifier inputs (which connects to the amplifier outputs), and 16 outputs. The CT16S is capable of handling 2 Amps Continuous for up to 1000W per channel. In the event that a failed channel is detected, the unit can switch the failed channel to an idle backup channel. Once the primary amplifier channel is back online, the unit will switch the backup channel back to the primary channel. All errors and switch operations will be reported to the management software. The CT16S hardware supports backup ratios ranging from 16:1 to 1:1; the exact ratio available is determined by the control system being used. A series of programmable GPIO’s can be used to connect the CT16S to external control devices. A total of 16 control inputs and 5 control outputs are built into the CT16S to provide enough control inputs for emergency use (for connection to local fire alarm contacts). In addition to the GPIO, an Ethernet connector is provided for additional configuration and control.